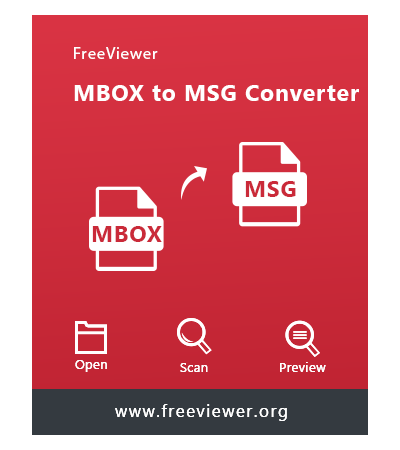 FreeViewer MBOX to MSG Converter is a versatile and risk-free utility that allows to export MBOX file to Outlook MSG format in a trouble-free way. With the free trial version, it lets users to scan and preview the data from the corrupted MBOX file. Install and launch MBOX to MSG Converter tool on the Windows system and click the Add File button to upload the MBOX file. 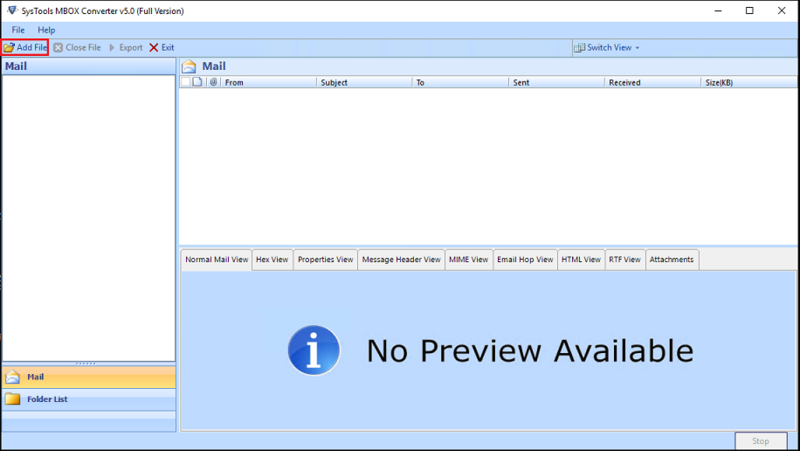 Renders multiple preview modes like Normal Mail View, Hex View, Properties View, MIME View, etc to view MBOX emails and its attachments. 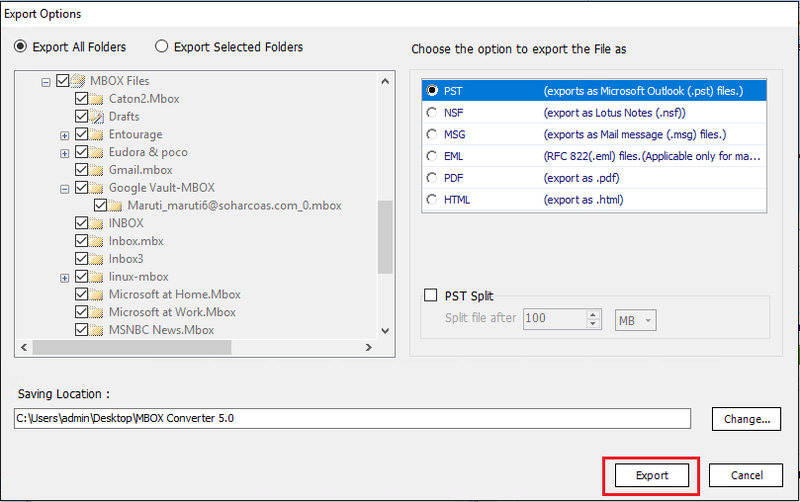 Select specific or entire emails from the MBOX file to convert into Outlook MSG file format. MBOX to MSG converter is a standalone software wherein users can export multiple or bulk MBOX files along with the attachments to MSG format. Moreover, it allows users to convert each MBOX as an individual MSG file or merge all of them into a single file. This converter tool is developed by the best technocrats to smoothly convert the MBOX file to Outlook MSG. Besides, converting into MSG file format, it also provides the option to export the MBOX file into various other file formats like PST, EML, HTML & NSF. Out of the bulk emails from the MBOX file, a user can convert the desired emails to the resultant MSG format. This option to export specific email from the bulky MBOX file is of great relief to the users when there is the need to convert only required emails. 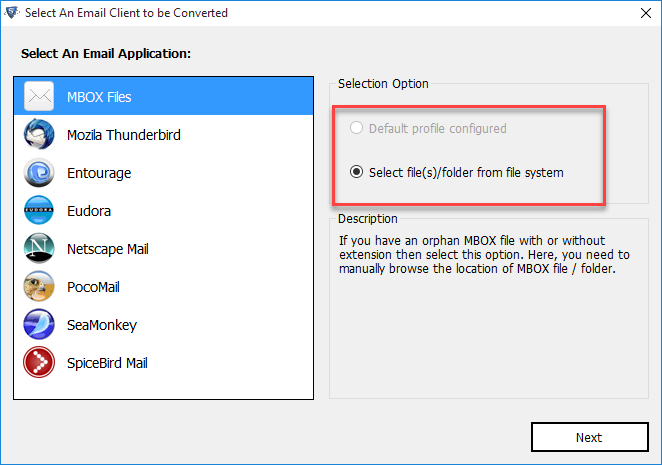 During the process of converting the MBOX file to MSG format, the tool renders the functionality to save the output MSG files by availing the different naming patterns. The various naming patterns include Subject, DD-MM-YY, and much more. Saving the MSG file with these patterns will allow users to sort the emails based on the saved patterns. 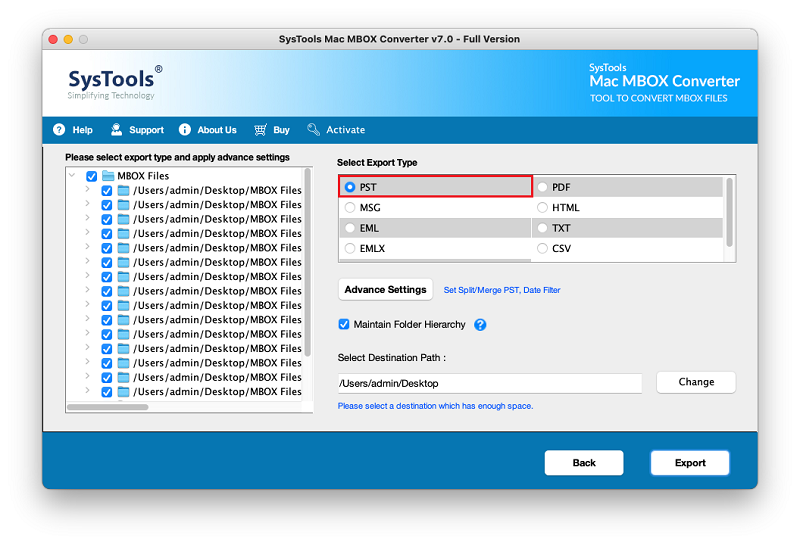 With the help of MBOX to MSG converter tool, now users can smoothly implement the conversion process to the resultant file format by installing the software on any Windows versions. This is because the tool is compatible with Windows 10 OS and all the below versions. Moreover, one can run this utility on 32-bit as well as 64-bit Windows OS. After successful completion of the file conversion process, the tool generates an export report stating all the details with respect to the exported items. Furthermore, one can save the report on the local system for future reference in CSV or HTML file format. 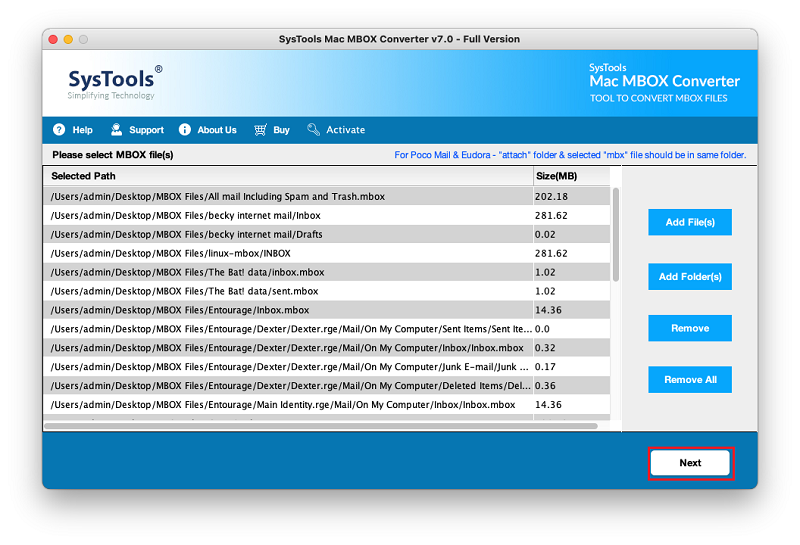 Trial Version of MBOX to MSG Converter Views all the MBOX Emails & Export only First 25 Items/Folder to MSG Format. Microsoft Outlook — Outlook 2003, 2007, 2010, 2013, 2016, 2019 (32 & 64 bit). Does the tool allow to export multiple MBOX files at once? Yes, the tool can efficiently perform the file conversion of bulk MBOX files to the destination MSG file format without any hassle. Is it possible to download this converter tool on Windows 8 machine? Yes, MBOX to MSG converter tool is designed by the best technocrats wherein users can easily launch this futuristic software on Windows 10 OS and all the prior versions. Does the tool provide the option to export the desired emails to MSG format? 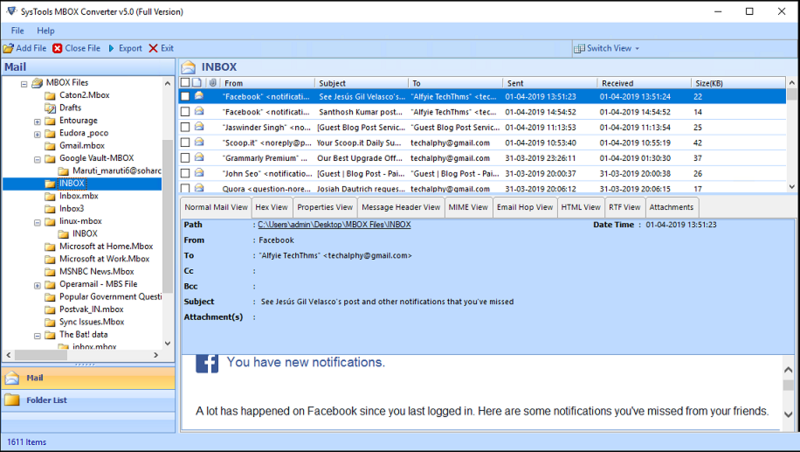 Yes, this software lets users to select the desired emails of one’s choice and later export the emails to Outlook MSG format. Apart from this, one can also convert the entire emails to the destination MSG file format. Which all MBOX supported email applications does the software supports? This tool is developed with the powerful algorithms in which it is capable enough to support all the MBOX supporting email applications like Apple Mail, Thunderbird, Eudora, Entourage and much more. 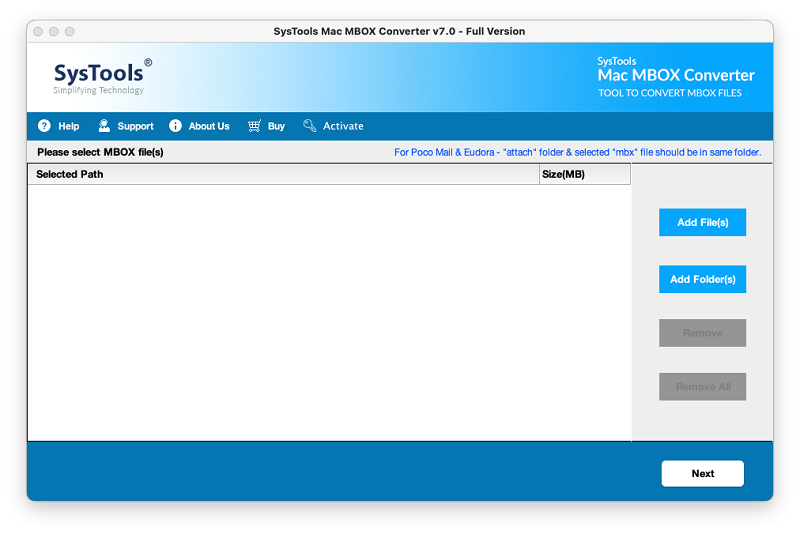 Does the tool render any advanced options while converting MBOX to MSG format? Yes, a user can make use of different naming convention patterns, which can be availed from the software interface. By this, one can smartly manage the emails based on the saved email patterns. Is it possible to view the emails from the corrupted MBOX file? Yes, One can smoothly view the emails out of the damaged MBOX file. This is because the tool effectively repairs the corrupted MBOX file and later provides the preview for the same. Mac MBOX to MSG Converter helps user to convert Mac MBOX files into MSG file format in a seamless manner. It is a versatile and feature-rich solution to convert multiple Mac MBOX files in MSG format in a batch. Moreover, the software provides robust security algorithms which permit the user to work without hassle. Generate an Export Report with Details: Mail Count, Fail Count, etc. Install and launch Mac MBOX to MSG Converter utility on your Mac system. Now, browse and select the Mac MBOX file which you need to convert to MSG file format. From the list of export options, select the MSG option and choose to maintain a folder hierarchy option. Also, to apply date filter and naming convention, click on Advanced Settings. Click on the Export button to begin the Mac MBOX files to MSG file conversion process. After the conversion process, one can verify the results by navigating to the destination location. Mac MBOX to MSG Converter software is high-performance and efficient utility to export Mac MBOX emails into MSG file format. The user just has to add the Mac MBOX files and select the export option as MSG. The software will convert all the Mac MBOX emails into MSG format in a hassle-free way. Considering the time constraint, sometimes the user needs to convert Mac MBOX files in a batch. Thus, to make it easy for all the users, the software is integrated with the Batch Conversion feature. This feature permits the user to convert multiple Mac MBOX files into MSG format in a batch. To perform the selective export process, the user can select or deselect the Mac MBOX files as per the choice while the conversion process. The software displays all the Mac MBOX files on the left pane, the user just has to select/deselect the Mac MBOX files and then initiate the Mac MBOX to MSG conversion process. The user can save the resultant MSG files by implementing the desired naming style provided by the software. The software provides various naming convention patterns such as by Subject, Date, etc. The user can select any of the naming styles while saving the MSG file after the conversion process. The user can also convert Mac MBOX emails to MSG format according to a particular date range. The user just has to select the Date Filter option in the Advanced Settings and select the specific date range in ‘To’ and ‘From’ fields. While the Mac MBOX to MSG conversion process, the software maintains the original folder hierarchy of the Mac MBOX folders. There is no alteration in the folder hierarchy even after the export process. Trial Version of Mac MBOX to MSG Converter Software Export 25 Items from MBOX Files to MSG Format. Can I convert Mac MBOX files to MSG format in a batch via the tool? Yes, with Mac MBOX to MSG Converter, the user can easily export multiple Mac MBOX files into MSG format in a batch without any issue. Is there any change in the folder hierarchy of the Mac MBOX folders after the conversion process? No, Mac MBOX Files to MSG Converter maintains the folder hierarchy of the Mac MBOX folder even after the export process. So, the user does not have to worry about any change in the folder hierarchy. Can I export Mac MBOX files to MSG format according to a particular date? Yes, the tool permits to convert Mac MBOX files to MSG format according to the particular date range. You just need to select the Date Filter option and then choose the date range in ‘To’ and ‘From’ fields. Does the Mac MBOX to MSG Exporter provide selective conversion option? Yes, the utility is integrated with Selective Export feature which allows the user to convert only the desired Mac MBOX files into MSG file format. Is there any issue associated with the software while converting Mac MBOX files into MSG format? No, the software is designed with top-notch security functionalities which makes it a reliable and performance-rich software. Moreover, there is no risk of data loss or breach while working with the utility. Does the software is having an easy-to-understand user interface? Yes, the utility is designed with a user-friendly interface which makes it hassle-free for both technocrats and novice users to work with it.